Just wondering if anyone was working on an editor for the Novation Peak synth. 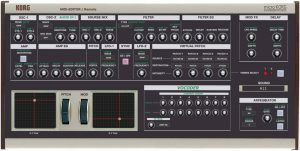 I’m having trouble connecting my Korg DW 8000 to the Ctrlr software. I’m using an M-Audio Uno MIDI in able to connect to my Mac’s USB. In the MIDI dropdown menu in the Korg controller panel I have the Device set to USB Uno MIDI Interface for Input, Controller, and Output. All Channels are set to 1. Any help would be much appreciated! This is an isomorphic keyboard for Windows based devices with touchscreen. I made it for my Microsoft Surface Book but it should work with any Windows based touchscreen device. I didn’t knew for a long time that Ctrlr has multitouch capability. It is not pressure or velocity sensitive but you can touch lots of keys at once and responsivity is pretty fast. 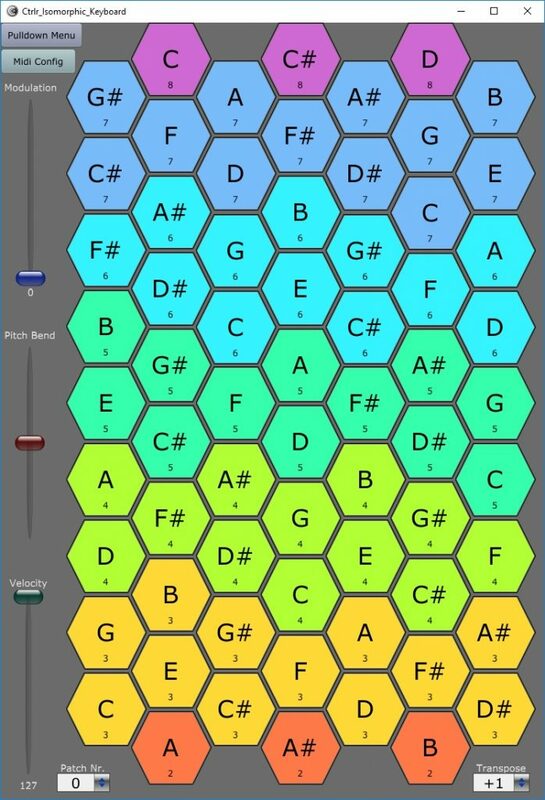 An isomorphic keyboard is interesting for chords play. Playing chords is always the same when you transpose or when you change root note. There is no Mac version as I don’t know of any Mac with touchscreen. If you would like to try it anyway, or if you would like a Linux x86/x64 version, let me know: roet32(at)gmail.com. Hi, my KORG “MicroKorg Midi Editor” is the first VST- PlugIn Editor /Controller for the legendary Synth “MicroKorg” . It`s a Remote and Sound Editor. The “MicroKorg” parameters can be automated, they can be stored in your Project. 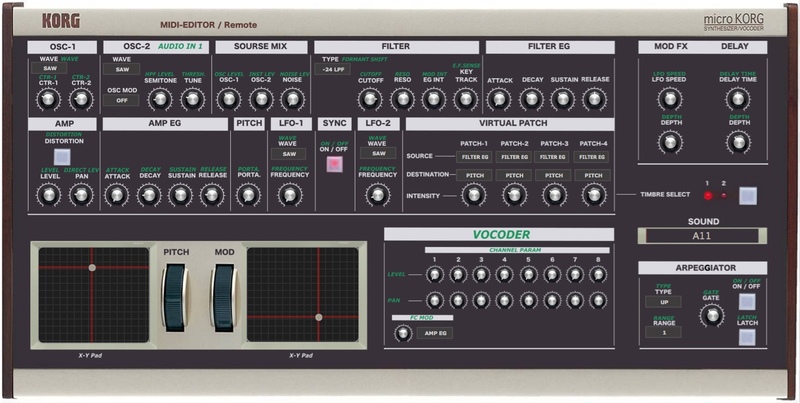 You can select the sound off the“MicroKorg” (Patch Number A11-b88 ). The hidden parameter can be changed on the“MicroKorg Midi Editor”, an stored on MiroKorg Hardware. I recently purchased Redominator which I though allowed for uploading Juno bank syx files. I have my old Juno 2 and used SysEx Librarian to save my personal patches in a 4 KB file. When I tried to load the syx file into ReDominator, I realized it only allows a single patch to upload (1 at a time). Does anyone know of a program (OS X preferred by Win will work as well) that would divide up a bank syx into separate patches? I have lots of banks and really do not look forward to either using a Syx editor for which I have no experience or trying to save each patch one at a time (times a million(. First thanks to the writers of this amazing software for your great & invaluable work which Iv been using for a few years now with no problems , until today ..when I (stupidly perhaps) loaded the Emu E4 beta panel into Ctrlr as a new panel. It completely crashed & has rendered my Ctrlr app & all the panels unusable. I can not open any of my other panels or erase the E4 beta panel, its just jammed/ crashed. The only thing I can do is quit Ctrlr. Im on Mavericks, OSX 10.9.5 & run Ctrlr as standalone. I erased Ctrlr.. trashed it ,& the VST & Component versions from my library & downloaded the latest version Ctrlr- 5.3.198 .dmg ( which worked fine with all my other panels (7). I restarted my computer after I trashed all the Ctrlr apps & the re-downloaded Ctrlr- 5.3.198 .dmg again & launched it & ***** ! its still there . It still opens stuck on the E4 panel. I would appreciate it if anyone could help me get rid of this **** ,no disrespect to the E4 panel developer intended. Its entirely my own fault for eagerly downloading an untested perhaps BETA panel.